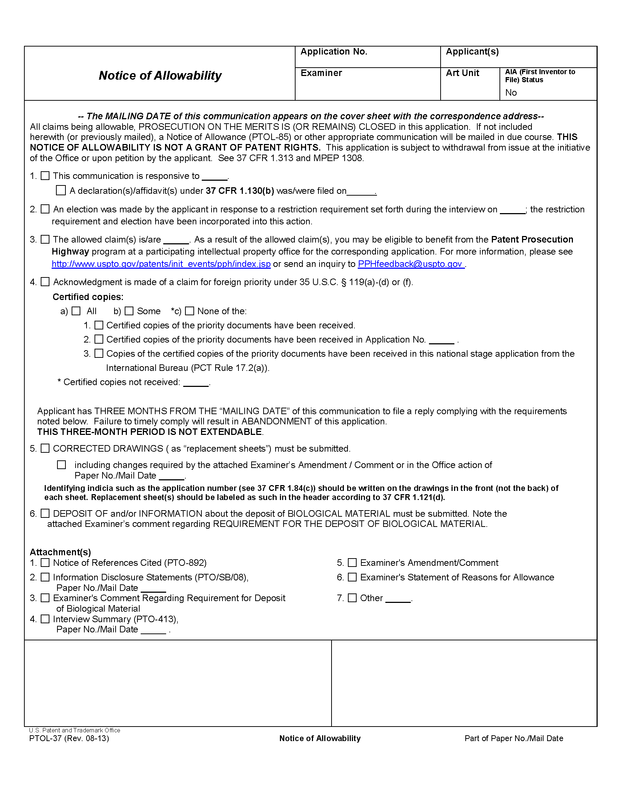 For applications filed prior to September 16, 2012 a reference to a prior filed application, for which benefit is claimed, is required in either the first sentence(s) of the specification or in an Application Data Sheet. For applications filed after September 16, 2012 a reference to a prior filed application, for which benefit is claimed, is required in the Application Data Sheet. If the application data sheet fails to include a required reference applicant should be contacted to supply a Supplemental or Corrected Application Data Sheet, in compliance with 37 CFR 1.76(c). See MPEP § 601.05(a) and (b). To minimize the possibility of the claim for the benefit to an earlier filing date under 35 U.S.C. 119(e), 35 U.S.C. 120, 121, 365(c), or 386(c) being overlooked it is recommended that the statement, “This is a division (continuation, continuation-in-part) of Application Number -/---, filed ---” appear as the first sentence(s) of the specification. For design applications see MPEP § 1504.20. In the case of an application filed under 37 CFR 1.53(b) as a division, continuation or continuation-in-part of a CPA, there would be only one reference to the series of applications assigned the same application number with the filing date cited being that of the original non-continued application. In applications claiming the benefit under 35 U.S.C. 119(e), a statement such as “This application claims the benefit of U.S. Provisional Application No. 60/ - --, filed - --” should appear as the first sentence(s) of the specification. In addition, for an application which is claiming the benefit under 35 U.S.C. 120 of a prior application which in turn claims the benefit of a provisional application under 35 U.S.C. 119(e), a suitable reference would read, “This application is a continuation of U.S. Application No. 08/ - --, filed - --, now abandoned, which claims the benefit of U.S. Provisional Application No. 60/ - --, filed - --.” Any such statements appearing elsewhere in the specification should be relocated. To identify a claim, an examiner’s amendment should refer to it by the original number and, if renumbered in the allowed application, also by the new number. Where an application otherwise ready for issue requires correction of the drawing, the application is processed for allowance in the Technology Center and then forwarded to the Office of Data Management. Any papers subsequently filed by the applicant, including replacement drawings, are matched with the application file. If the drawings that are received are still not acceptable for publishing, the Office will mail a “Notice to File Corrected Application Papers,” giving the applicant a time period in which to file the corrected drawings. See MPEP § 202 and § 214. When an application is in condition for allowance, an interference search must be made by performing a text search of the "US-PGPUB" database in EAST or WEST directed to the comprehensive inventive features in the broadest claim. If the application contains a claim directed to a nucleotide or peptide sequence, the examiner must submit a request to STIC to perform an interference search of the sequence. The text search may make use of the ".CLM." search symbol in order to limit the text search to the claims of the database references. If the search results identify any potential interfering subject matter, the examiner will review the application(s) with the potential interfering subject matter to determine whether interfering subject matter exists. If interfering subject matter does exist, the examiner will follow the guidance set forth in MPEP Chapter 2300. If there is no interfering subject matter then the examiner should prepare the application for issuance. A printout of only the database(s) searched, the query(ies) used in the interference search, and the date the interference search was performed must be made of record in the application file. The results of the interference search must not be placed in the application file. Completion of the interference search should be recorded in the “Interference Searched” section of the OACS “Search Notes” page with notation such as “PGPUB text search – March 1, 2005, see interference search printout” coupled with the examiner’s initials. Examiners must review the data regarding prior U.S. applications to make sure that the information is correct when preparing the application for issue. If any claim to domestic benefit under 35 U.S.C. 119(e), 120, 121, 365(c), or 386(c) is added, deleted, and/or modified during prosecution of the application and such addition, deletion, and/or modification has been approved, the examiner must make sure that the information in the PALM database is current and up to date. If the PALM system has not been updated, the application must be forwarded to the Technology Center (TC) Legal Instrument Examiner, with an explanation of the correction to be made. Examiners should also review the data regarding prior provisional and foreign applications for accuracy. See MPEP § 202 for notations to be placed in the file history as to parent or prior U.S. applications, including provisional applications, and foreign patent applications. (A) If multiple claims are selected, the claim numbers should be separated by commas. 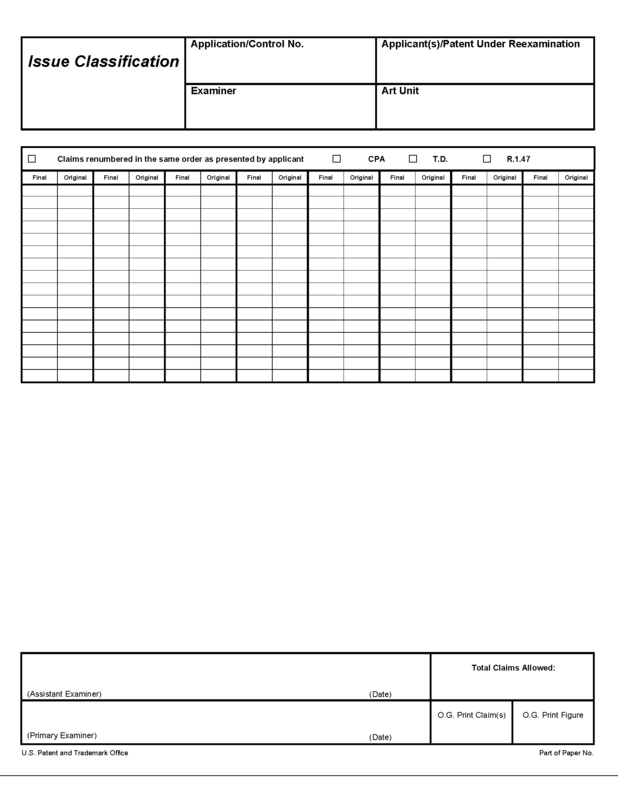 Examiners, when preparing an application for issue, are to record the figure selected for printing in the Official Gazette in the box labeled “Print Fig.” on the Issue Classification sheet. Ordinarily a single figure is selected for printing. This figure should be consistent with the claim to be printed in the Official Gazette. The figure to be printed in the Official Gazette must not be one that is labeled “prior art.” If there is no figure illustrative of or helpful in understanding the claimed invention, no figure need be selected. 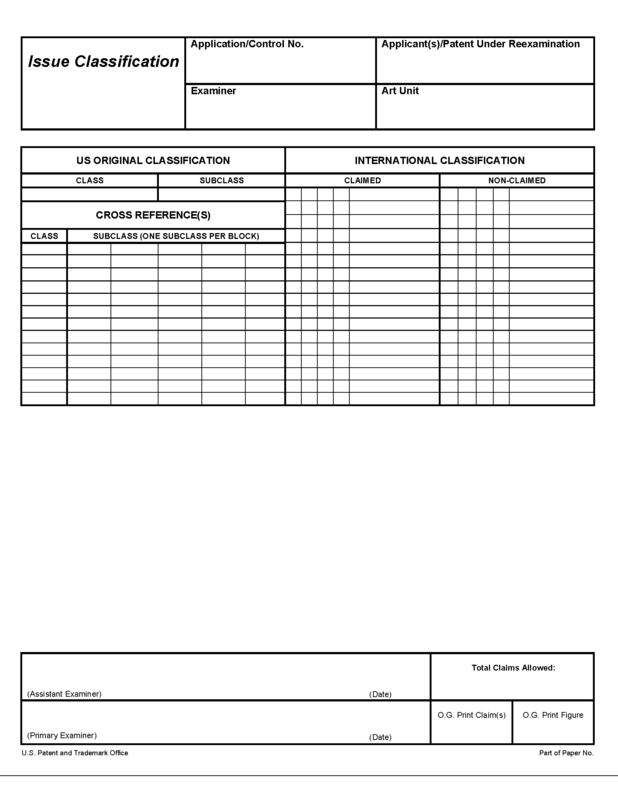 “None” may be written in the box labeled “Print Fig.”on the Issue Classification Sheet. In the first action after termination of an interference or derivation, the examiner should make of record in each application all references not already of record which were pertinent to any preliminary motions and which were discussed in the decision on motion. The primary examiner and the assistant examiner involved in the allowance of an application will apply E-Signatures on the Issue Classification sheet. A primary examiner who prepares an application for issue signs the file wrapper only in the “Primary Examiner” box on the Issue Classification sheet. In most cases, the examiner’s actions and the applicant’s replies make evident the reasons for allowance, satisfying the “record as a whole” proviso of the rule. This is particularly true when applicant fully complies with 37 CFR 1.111(b) and (c) and 37 CFR 1.133(b). Thus, where the examiner’s actions clearly point out the reasons for rejection and the applicant’s reply explicitly presents reasons why claims are patentable over the reference, the reasons for allowance are in all probability evident from the record and no statement should be necessary. Conversely, where the record is not explicit as to reasons, but allowance is in order, then a logical extension of 37 CFR 1.111 and 1.133 would dictate that the examiner should make reasons of record and such reasons should be specific. Where specific reasons are recorded by the examiner, care must be taken to ensure that statements of reasons for allowance (or indication of allowable subject matter) are accurate, precise, and do not place unwarranted interpretations, whether broad or narrow, upon the claims. The examiner should keep in mind the possible misinterpretations of his or her statement that may be made and its possible effects. Each statement should include at least (1) the major difference in the claims not found in the prior art of record, and (2) the reasons why that difference is considered to define patentably over the prior art if either of these reasons for allowance is not clear in the record. The statement is not intended to necessarily state all the reasons for allowance or all the details why claims are allowed and should not be written to specifically or impliedly state that all the reasons for allowance are set forth. Where the examiner has a large number of reasons for allowing a claim, it may suffice to state only the major or important reasons, being careful to so couch the statement. For example, a statement might start: “The primary reason for the allowance of the claims is the inclusion of the limitation in all the claims which is not found in the prior art references,” with further amplification as necessary. Most instances when the examiner finds a need to place in the file a statement of the reasons for allowing a claim or claims will come at the time of allowance. In such cases, the examiner should (a) check the appropriate box on the form PTOL-37 and (b) attach thereto a paper containing the examiner's statement of reasons for allowance. 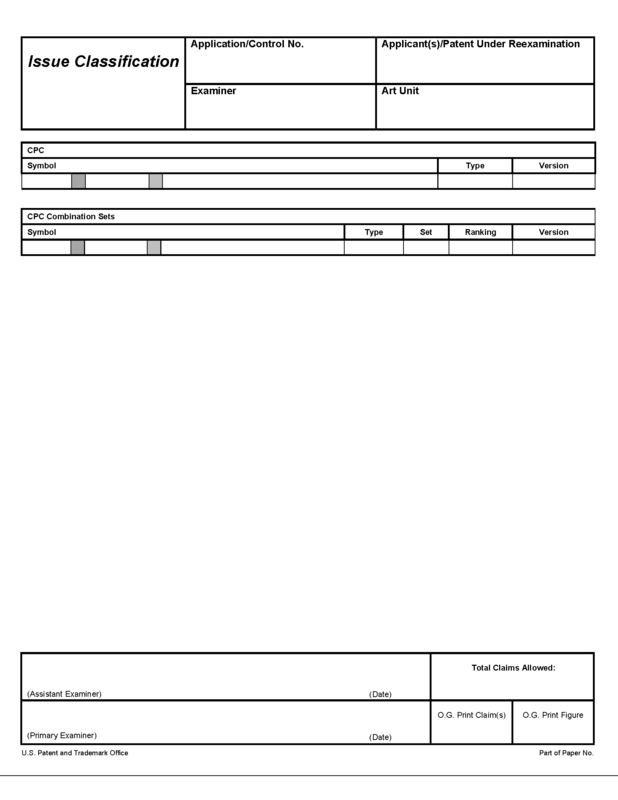 The paper should identify the application number and be clearly labeled “Statement of Reasons for Allowance.” It should also specify that comments may be filed by the applicant on the statement and should preferably be submitted with the payment of the issue fee so as not to delay processing of the application and in any event no later than payment of the issue fee. Comments filed by the applicant on the examiner’s statement of reasons for allowance, should preferably be submitted no later than the payment of the issue fee, to avoid processing delays. Such submissions should be clearly labeled “Comments on Statement of Reasons for Allowance.” Comments will be entered in the application file by the Office of Data Management with an appropriate document code in the file wrapper.